Roller skating has been a favorite activity of mine since the teenage years. What a great social activity. The local roller rink was a most important hangout for us 13-14 year old kids. I always went to the rink with Brian to hang out on Friday or Saturday nights. We met a few girls at the rink that we ended up "dating", as a couple of couples (if you could call it dating?). The popular music of the time (at least at the rink and on AM radio) was "bubblegum" music. The groovy groups were the Archies, Cowsills, Andy Kim, 1910 Fruitgum Company, Partridge Family, Tommy James & the Shondells, Tommy Roe, Tony Orlando & Dawn, and Bobby Sherman. Boy was that goofy music or what? Psychedelic music was also popular at the time, but the rink wouldn't play it. First of all, there wasn't a dance beat to it, and secondly, psychedelic songs are too long. We should consider ourselves lucky, just a few years prior, the music played at roller rinks was organ music. Most rinks in the '60s had an organ in the balcony, and at times feature a live organist. When I hit the age of 16, skating was forgotten, it wasn't cool anymore, and besides, I had a car. But when I turned 21, and I had been in the Navy 2 years, I was stationed in San Diego with little else to do except hang out in the bars. So, as an alternate activity I would go roller skating. Now roller skating in San Diego was hip. There were probably 6 or 7 rinks in the area plus skating on the boardwalk. At one of the urban rinks on a Friday night, the crowd was thick with a 50-50 racially mixed crowd. A form of skating called rexing was popular - the whole skating floor would skate backwards with people flying through the crowd, winding their way across the flow of the traffic. It was intense; it was something you definitely had to work yourself up to. I tried all the rinks out. When I was in town (not at sea), I would skate 2-3 times every week. I learned backwards skating and how to boogie a little at the same time. It was a great activity to occupy the hours while being far from home. I received a pair of roller skates as a Christmas gift one year and that improved the enjoyment of skating immeasurably. As time went on, I continued skating, and still skate today. The options aren't quite as broad here in Cincinnati as they were in San Diego, but there are a couple of acceptable rinks around. My wife goes skating with me, and I think she actually enjoys it. Well, maybe she goes to humor me, or maybe because she knows I like it a lot and the exercise is good. Well, if you've read this far, you may actually find this article interesting. So I'll mention the history of skating. 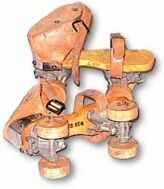 The first roller skates were the kind you strapped to the outside of your shoes (see wooden skates at left). From what I can conclude, skating was invented by a Belgian by the name of Joseph Merlin in 1760. In 1863, James Plimpton, a businessman from Massachusetts invented a roller skate that could turn; it was called the rocking skate. Within 20 years, skating became a popular pastime in the northeast. In 1876, the toe-stop was invented, and in 1884 the use of ball bearings was introduced by inventor Robert Henley of Indiana. Micajah C. Henley, Robert's uncle, started manufacturing roller skates at his Richmond Indiana factory and reached peak production of 15,000 pairs of skates per week. Skating has taken a few turns along the way. Roller hockey and inline skating are very popular, I'm just too far along to adopt these "upstart" ways. Urban areas have parks and areas where skater bums get their recreation at. There's a bit of an "aggressive skating" subculture out there. George Robbins Home Page: Exhaustive links to roller skating resources - FAQs, rink locations, usenet groups; covers quad, aggressive & figure skating. Lisa Suggitt's Page: Many Links to Aggressive Skating - She's the RollerGirl from Canada. This site has many pics and videos and an online store. That's her in the pic at the left (notice she's wearing quad skates!). Kathie Fry - Page Editor: Articles and News about Skating; links to skating in dozens of countries - check out the "Site Map".